Evike has recently started creating a line of custom guns using G&G Combat Machine M4 models as the base, with a variety of different rails, barrels, and stocks to finish up the custom look. At the time of this review, there were at least a half dozen different models, all with their own unique selection of parts. This review is of the JBU "Kurz" custom model, which has this front end kit installed on it. Now, these models are a great deal, considering the kit alone runs $130, and I will cover all of the various aspects of this awesome custom gun by Evike in this review! I came across these custom models in one of my usual browsing sessions in Evike's "New Items" section. I saw a plethora of custom designs, all based on the G&G Combat Machine blowback series of guns. My contact at Evike informed me that they are making several different custom guns, some based on guns from video games and movies, and some based purely on imagination. Evike was kind enough to send over one of these guns, in order to have it reviewed here on Airsoft Retreat! These custom guns range in price from about $190 up to about $230 from what I've seen thus far, putting them right in line with the pricing on the standard factory G&G Combat Machine models. The Kurz model that I received came packaged in a G&G box, which is basically a plastic inner liner designed to hold a wide range of AR models, all enclosed in a cardboard sleeve. Now, it's not the most secure box that I've ever seen, but Evike packaged it inside another box for shipping, and it made it to me just fine. This gun qualifies for Evike's free shipping, so be sure to use that coupon when ordering! I received a pretty bare bones package, which is what I would expect from a custom gun like this. It included the gun, a single hi-cap magazine, and a cleaning/unjamming rod. No battery was included with this gun, which again, is something that I've come to expect with retailer custom models. I prefer it this way, as I'd much rather pay a lower price up front and use one of the batteries that I already have. If you don't have a battery, definitely order one with the gun. Being that this is based on the "Combat Machine" G&G model, it features a high impact plastic body. Now, this is not your normal cheap plastic body, with fragile rear tabs or anything like that. It is a very strong polymer, and is a similar design to most metal bodies, in that the upper receiver slides onto the lower. This makes it stronger, with no wobble whatsoever, and is generally a better design overall. Starting at the rear, you will notice that this gun is equipped with a "Crane" style stock. The stock itself is made of plastic, and is attached to the gun using a specially designed buffer tube. The tube has cuts at the rear to allow for your battery wires to pass smoothly during stock extension and retraction, depending on the type of battery used. Now, I HATE normal crane style batteries, which use three cells, and I usually prefer to use a nunchuck system, with a set of cells in each stock compartment. On my gun, I am using a custom built 7.4v buffer tube LiPo battery, so the stock configuration is kind of a moot point, but for the purpose of the review, I test fit a nunchuck layout Intellect 9.6v 1600 mAh 2/3A pack in the stock with no issues. You won't be able to fit sub-C cells in the stock, so you're pretty much limited to 2/3A, AAA, and some LiPo cells. Where the stock meets the receiver, you will find a single sling point, which is designed for right handed operation. I'm happy to see more companies including single point sling mounts, as frankly, I despise dual and three point slings. I just can't ever make them comfortably work for me, and if I have to use a sling, it will always be a single point model. The receiver, as mentioned previously, is constructed out of a strong polymer, and has a very nice matte black finish. The layout is pretty much the same as your normal M4, with the selector switch located on the left side, and the magazine release and forward assist being located on the right. Now, one unique part about this gun is the functional forward assist, which decompresses the spring. Pushing it will release the anti-reversal latch, which will let the spring decompress. The selector switch moves smoothly between the different setting, clicking positively into each position. Trigger pull is smooth and light, like most other AEGs. The front pin is a "captive" design, meaning that it won't pop out of the gun entirely, so you shouldn't lose it when field stripping the gun. Holding onto the gun is an easy task with the standard M4 style pistol grip, complete with ventilated motor base. Now, the really unique part about this gun is the inclusion of the JBU Kurz front end, which consists of a short, 3.75" long free float rail kit, short outer barrel, and fat, stubby mock silencer. The RIS is an interesting design, and is a bit larger than most other free float rail kits. It consists of two main pieces, the barrel nut, and the single piece handguard with rails located at 12, 3, 6, and 9 o'clock. It fits the gun extremely well, with no wobble, and only a 5mm gap at the receiver. The rails are cut to spec from what I can tell, and I didn't have any issues fitting accessories on it. The outer barrel is hidden entirely by the muzzle device, but it is about 3.5" long, and is a single piece design. The muzzle is equipped with a JBU Kurz mock silencer, which has its own serial number laser engraved on the side. The can is just under 1.75" in diameter, making it quite fat compared to other models. The inner barrel extends up to about 10mm of the muzzle, nicely optimizing the outer barrel and "can" length. The outer barrel is threaded 14mm-, so you can add a different muzzle device if you wanted to. Aiming this gun is tricky, as there are no included sights. You will want to either add your own sights, or install an optic of some type. The top rail is 20mm, and is molded into the one piece upper receiver. I have a CMore style reflex sight on the way for mine, and I think it will fit the look of the gun quite well. Overall, the externals are great, especially the JBU front end kit. The plastic body seems quite strong, and is really light weight, making it well suited for CQB use. The gun has a blend of real and fake trademarks, depending on what part you are looking at. The receiver has G&G trademarks, including a stylized G&G logo and the requisite "Made in Taiwan" on the left side of the receiver. The JBU front end has licensed Olympic Arms trades on the RIS, and JBU trades on the "can". The included magazine is a metal hi-cap, which holds about 450 rounds. In keeping with the normal G&G design, it is longer than normal, making the overall length closer to real steel mags compared to other AEG magazines. It has caliber markings located on the left side, and G&G trademarks on the bottom. It feeds the gun quite well, with no noticeable mis-feeds. Fit into the magwell is decent, with no side to side wobble, and only a few mm of front and back wobble. I tried magazines by JG, ICS, DBoys, Army, MAG, and SRC with no issues. Rate of fire using a Kong Power 7.4 1100 mAh LiPo battery wasn't knocking my socks off, only giving me 13 RPS. With an 11.1v LiPo, it rose, obviously, but was still only about 17 RPS, quite a bit less than similarly spec'd guns. I believe that it is due to the high torque motor, and the somewhat hot spring that delivers 350+ FPS out of a very short inner barrel. I plan on lightening up the spring to hit 300 FPS, and adding an Element high speed motor, turning this into a CQB monster. Range and accuracy was actually pretty decent, considering the size of the inner barrel. Using TSD .25g ammo, I was able to hit man sized targets 90% of the time at 140'. The hop-up puts plenty of spin on the BBs, and the G&G bucking seems to do fairly well at keeping the BBs from having too much side to side deviation. 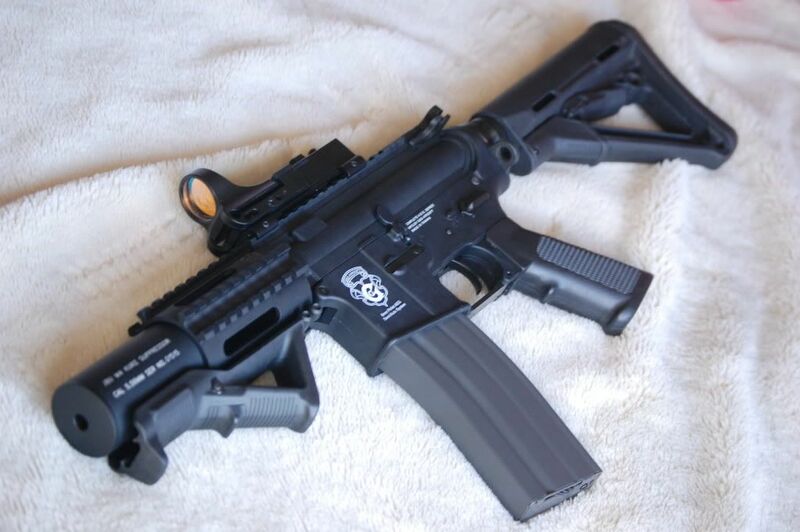 This is a gun that's designed for CQB, and it's plenty capable in that regard, while still having long enough legs to be effective in mid range outdoor use. This gun utilizes the Top Tech design pneumatic blowback gearbox. It's basically a V2, but with several key changes to make the blowback system work. It is built for strength, with rounded cuts at the cylinder window, and a thick front shell. Removing the gearbox from the body is really straightforward, just like most other AR variants. Remove some pins, the mag release, the grip and motor, and pull the gearbox from the lower receiver. Once you pull it out, you'll notice that it's not your normal V2 gearbox. Internally, most of the parts are V2 compatible, with only a few parts critical to the pneumatic blowback system being the real changes. These models are equipped with 8mm solid metal bushings, instead of the 8mm ball bearings that the Top Tech guns use. The motor doesn't have too strong of magnets, and is unmarked as to whether it's a high torque or high speed model. Given my brief history with G&G "Sportline" models, they don't come with the best motors in the world, and are slightly tuned towards higher torque than speed. I plan on replacing the motor and seeing what results I get. The hop-up is made of plastic, and the included barrel appears to be made of aluminum. The inner barrel is quite short, only 7" (177 mm) long. Quality on the inner barrel is quite nice, with a mild crown and smooth construction throughout. Being that this is basically a pre-customized M4, you can tweak it in innumerable ways to your liking. I have installed a Magpul CTR stock, and AFG grip, which really fits the look and feel of the gun extremely well, making it into a PDW of sorts. The rail and can length are perfect for the AFG, and the gun is very easy to handle now. Sights or an optic are pretty much a must, as none are included, and for these pics, I've installed an NCStar mini red dot sight. I first brought news about G&G's pneumatic blowback system years ago, at SHOT Show 2008, but this is the first blowback model from them that I've actually gotten my hands on. It's an interesting system, giving you blowback without the normal extra wear and tear on your gearbox. This system in an inexpensive polymer body is a fantastic package. Add in your choice of front ends from Evike's custom gun selection, and you have a great gun at a great price, ready for you to customize and make your own! Many thanks again to Evike and of course, Airsoft Retreat!